Importance of the Study of the Development of Vegetation and Advances of Stock/Vegetation Mapping. · Vegetation maps present an inventory of existing plant communities, their location, extent and geographical distribution in the landscape at the time of mapping. · Vegetation maps are scientific tools for analyzing the environment and the relationships between vegetation and the site on which it occurs. This help to explain the distribution of plant communities on the basis of the physical and chemical features of the landscape, on the other hand, plant communities allow conclusions on the nature of the environment. · The character of vegetation is dynamic and increasingly affected by man. Vegetation maps are valuable standards of reference for observing and measuring changes in the vegetation, their direction and their speed i.e. the rate of change. · Vegetation maps can serve as a scientific basis for planning future land use, especially with regard to Forestry, Range Management, and Agriculture in all its form and variations. Such ecological based planning permits an optional land-use, managing for highest yields on a sustained basis without damaging the environment. · The development of the field of vegetation mapping, the circles are expanding steadily. Vegetation consists of plants. It seems logical, therefore, botanists are by no means the only one interested in vegetation maps. · There are growing numbers of Geographers, Zoologist, Geologists Plant and Animal Ecologists, Pedologists and an ever-increasing multitude of people concerned with land-use planning, Forestry, Agriculture and Conservation, with climatology and communications investments and fiscal problems, education and military matters who are discovering the practical value of vegetation maps as applied to their respective fields. · Vegetation is so closely tied to its environment that an appreciation of its character can reveal the qualities of the sites on which it occurs. “A qualified analyst looks through a vegetation map even as a physician looks through an X-Ray screen in the Human body”. (Tuxen, 1958). · The structure, composition and several other characters of plant communities can be described just be visual observations. · In a qualitative approach, measurements are not made. ii. 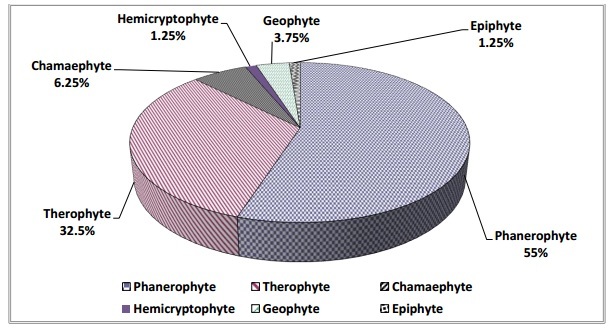 Stratification of the vegetation type. iii. Socialibility or Nature of groupings. 4 = generally present or rare, less frequent, frequent and abundant. · They are trees, shrubs, climbers etc. in which the growing buds are situated on the upright shoot, above the ground surface. iv. Nano- phanerophytes – less than 2 meter tall. · Such plants are generally found in cold areas of high altitudes or high latitudes. · Buds are located at a height of not over 30 cms from the ground surface e.g. · At times the parts above the bud perish during extremely cold conditions. · This class of species is also found in cold areas. · Perennating buds occur below the soil surface, where they remain protected from adverse conditions. · This class is largely composed of Biennial or perennial herbs, whose vegetative growth and aerial portions are marked only during the warm season. · Even if buds come over the soil surface, they remain hidden under the layer of dead leaves, twigs etc. · This class has also been termed as Geophytes. · Buds are always buried in the soil or are present as bulbs and Rhizomes. · They are very well conditioned to withstand long spells of adverse weather conditions when food storage in the buds also forms an important feature. · This class of plants passes off the adverse period in the form of seeds. · Such plants go on produce flowers and seeds under favorable conditions. · Such plants are annual in characters. · The Ratio of the life form of various species in form of percentage or numbers in any floral community is known as biological spectrum. · However, it has been seen that the utility of this system of classification is limited. · It is the number of individuals of a particular species in a unit area or volume. · This is the primary character of a community. · The community set up is affected to a certain extent by the density of different species forming the community. · This is indicative of the dispersion of a particular species in a community. · It is denoted as the percentage occurrence of individuals of a particular species in a number of readings or observations. · Hence, an estimate of frequency depends to a large extent on the size of the sampling quadrant underestimates the frequency and the largest quadrant overestimates it. · This is a measure of the relative importance of a species in the particular community. Land area occupied by the cross-section of the stem of an individual. The total land area occupied by the canopy of the individual. · These characters are based mainly on frequency studies. · The term constancy is generally used in cases where an equal sampling unit is taken for each stand and the term presence is brought to use in cases where the sampling unit varies from stand to stand. · It denotes the degree to which a species is limited or restricted in occurrence in a particular community. · Those, in other words, a species having high fidelity is restricted in occurrence only to some communities, whereas, a species with low fidelity is restricted in occurrence to a large number of communities. · Fidelity is a close relation to the ecological amplitude of a particular species, this means that the species having low fidelity has a wider Ecological amplitude. § Species occur frequently in one community type and in a few cases in other too. § Species occur in a number of communities but more abundant in some. § Species may occur in any type of community without a marked presence for anyone. § Species which has a rare occurrence may be as relicts of earlier stages of succession. · This is indicative of the relative importance of a species in a particular community. · This is expressed by characters like frequency, cover, density, biomass or productivity. · However, none of these features can singly express dominance in a befitting manner e.g. § An individual tree having a larger canopy and fairly high biomass is of little consequence in a grassland ecosystem. § In the same way abundant they may be, have little importance in a forest ecosystem. · Thus it may be concluded that the total IVI’s of all species forming a particular community is 300. · Plants occur together in groups within a particular set of environment making a community. · Therefore a community can be described by recording their identity, growth form and structure. · The study includes number, size, distribution, and spacing of individuals within a community or between communities as well as its relations with the physical environment. · In these methods, the most important role is performed by the QUADRATS. · This is a frame having a fixed shape and area. · QUADRATS may be square, rectangular or even circular. § A number of quadrats of size increasing successively, are marked in the field in a way that the area covered by smaller quadrat is observed in the next bigger quadrat. § The numbers of species which occur in the different quadrats is observed and recorded in a proper form. § Then a curve is plotted between the number of species and size of quadrats. § The point at which this curve becomes flat is taken to be the minimum size of quadrat which is required to be laid out. § The number of species in each quadrat is observed and recorded. § A curve is plotted between the cumulative number of species observed and the number of quadrats in which observations were made. § The point where the curve becomes horizontal denotes the minimum number of quadrats required. § A PANTOGRAPH may be used to chart plant communities. § It consists of a quadrat, a movable joint, and a fixed pivot or point. § By means of this arrangement, the observations made under field conditions can directly be transferred on to a drawing board. § A permanent or fixed quadrat demarcated in the field is used to make observations from time to time, with regards to changes in composition etc of the community. · This method is used for the study of those communities, where the laying out of quadrats become difficult. · This method can be further sub-divided into two-point centered quadrat method and point frame method. · Of this the point centered quarter method is widely used.